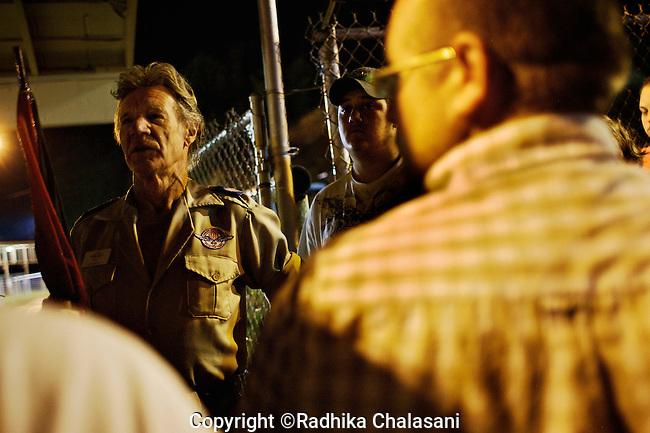 WISE, VIRGINIA-JULY 26: Stan Brock, the founder of Remote Area Medical (RAM), talks to people waiting to register for free medical treatment at the Virginia-Kentucky Fairgrounds to bring them into a sheltered area after thunderstorms drenched the crowd pre-dawn July 26, 2009. The two and half-day event helped provide health care for 2,715 people, most of whom are uninsured or underinsured with unaffordable co-pays or high deductibles for their insurance policies. RAM, operating in 5 states this year as well as overseas, provides free medical, dental and vision care to people in need. Organizers estimate that they spent $250,000 USD to provide over $1.6 million USD worth of care..